I have a small amount of bitcoin on Coins.ph and decided to cash it out the last week. First, I am about to withdraw it to my BDO account but since I’ve heard a lot of rumors that BDO accounts are having “issues” when there’s a cryptocurrency transaction involved and decided to use the instant cash out option through Security Bank’s eGiveCash to avoid such problem. For those who will use eGiveCash option in withdrawing their cash in their Coins.ph wallet, please remember that you are only allowed to withdraw P5,000.00 per withdrawal request with a maximum of P50,000.00 per day. Upon request, you’ll be asked a mobile number where Coins.ph will send 2 text messages that will contain a 16-digit eGivecash number and a 4 digit PIN that you will use to withdraw the money via Security Bank’s ATM. I successfully withdraw two transactions last week through this method but yesterday’s transaction was different. After my Cash Out request at about 7:40am, I received a different message. Instead of getting an eGivecash number and a PIN, I got a “sorry” message that indicates that Security Bank failed in processing the request. I immediately email Coins.ph’s customer support and asked about this event. Their Customer Service immediately replied that they already informed the Security Bank about the issue and waiting for their response. I waited for several hours and I didn’t receive any update from Coins.ph so I message them again and asked the time that this issue will be resolved. According to their CS, it will take 12-24 hours for Security Bank to respond to this kind of issue so I need to wait till they reply. As of this writing, I didn’t receive any update yet but I was assured by my friend who encountered the same issue with Coins.ph withdrawal that they will return the said balance as soon as they verified the final status of the transaction with Security Bank. Update: Today, Coins.ph return the fund to my Peso Wallet. Yey! 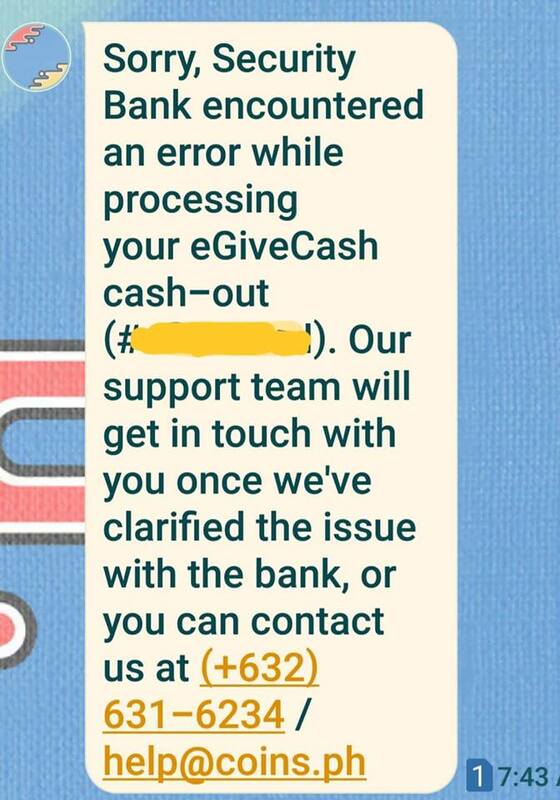 How about you guys, did you encounter the same problem with Coins.ph eGiveCash cash out option? What’s your experience? Let us know by leaving your comments below. hi po…good evening..ask lang po ako..ilang hours po ba bago naibalik ang pera sa peso wallet nyo po?salamat po..same situation right now..I am so worried.